Dark chocolates are our strongest suit. We are not fond of the milk and white chocolate varieties as we find them too sweet to our liking. We have different brands of chocolates at home such as consumer brand chocolates like lindt and industrial brands like callebaut. There are times when I find it tedious to cook, that is bringing water or milk to a boil and stirring constantly, and all I want to do is press the button of an electric pot boiler, wait while browsing the internet, and have a chocolate drink after, fast and convenient, then this is one of my go-to chocolate drink. This recipe gives me a very thick, very rich, very chocolaty, very delicious hot chocolate drink. 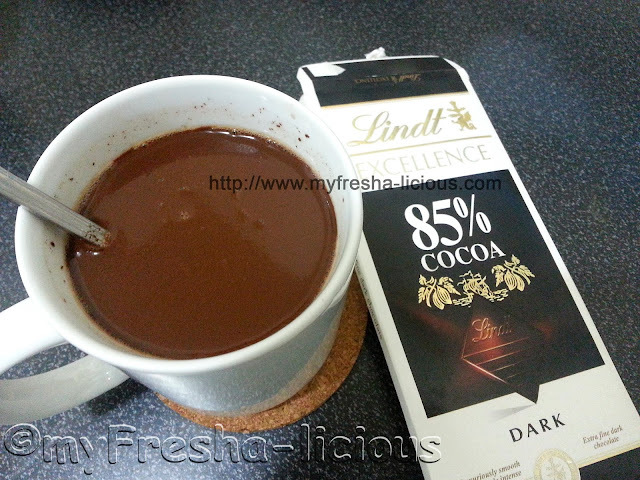 I make use of dark chocolates, and in this recipe I used Lindt. The higher the cocoa content, the better not only with regards to its health benefits but also it provides better and richer chocolate flavor. We have a few recipes of cocoa and chocolate drinks including Filipino native chocolate drinks, check them out by clicking myFresha-licious Cocoa & Chocolate Drinks. 1. Pour water in an electric pot boiler and press the button to coil :-) you can boil your water in whatever way you want. 2. In a cup, mix the dry ingredients well. Break the chocolates into small pieces. 3. Pour the hot water on the dry mix and and chocolates and stir until your drink is thick.